Dante will be killing demons in his cinematic debut, but everything else is up in the air. Screen Gems, the studio behind the Resident Evil movies, has bought up the rights to another Capcom franchise, Devil May Cry. The RE movies have grossed more than half a billion dollars, and it seems that Screen Gems is hoping that the Capcom lightning will strike twice. It almost goes without saying, but there are not a lot of details about the movie right now. The very vague plot is that Dante is killing demons to avenge his mother's murder, and that's pretty all we've got so far. It's not clear whether this it's the original Dante, or the new Dante from Ninja Theory's reboot, that we're talking about either. It could even be some new Dante designed just for the movie. Reports say that Screen Gems has hired screenwriter Kyle Ward to create the script. Ward does not have a lot of big action movies - which a Devil May Cry film is almost certainly going to be - on his resume. In fact, he doesn't have a lot of anything on his resume, having only written one feature film before. He must have impressed someone though, as aside from DMC, he's also been hired to write the script for the Kane & Lynch movie. 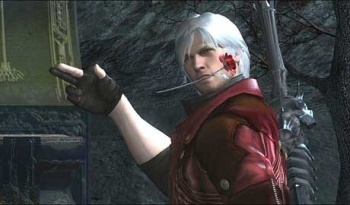 A Devil May Cry movie could be ridiculous amounts of fun, kind of like a supernatural, tongue-in-cheek Matrix. If the Resident Evil movies are anything to go by, it's not necessarily going to be a faithful rendition of the games, but as long as it has the over-the-top fight scenes with stupidly large swords and guns, it will probably work just fine.